To post news in Society Page, send e-mail to geotimes@agiweb.org with the subject: Society Page. The American Geophysical Union (AGU) presented Richard Monastersky, senior writer for science topics at The Chronicle of Higher Education, and Diane Tennant, staff writer for The Virginian-Pilot, the 2002 awards for excellence in science journalism on May 29 during its spring meeting in Washington. Following up on a tip from a friend at the Virginia Museum of Natural History, Tennant went beyond the press releases and media conferences to learn why the U.S. Geological Survey (USGS) was drilling the site of a buried impact crater on NASA property in southeastern Virginia. She visited with David Powars of the USGS and immediately knew she was on to something larger than a one-day news story. He just started talking and he waved his hands and got on his toes and he was so engaging. I thought, what a great character for a story, Tennant says. After nine months of research, Tennant produced a seven-part series published June 24-30, 2001. Based on the first three parts of A Cosmic Tale, Tennant won the Walter Sullivan Award for features. Monastersky won the David Perlman Award for his news story A Plucky Spacecraft Explores a Distant Asteroid, published March 2, 2001. Id never watched a spacecraft land on an alien world before, Monastersky says. And I wasnt reporting during the Moon landing, he laughs. When the Near Earth Asteroid Rendezvous (NEAR) Shoemaker probe landed softly on Eros last year, Monastersky witnessed the event surrounded by scientists, engineers and other journalists in the auditorium at the Johns Hopkins laboratory in Laurel, Md. Monastersky followed the story of the plucky probes adventure to the distant asteroid and its unexpected survival after the landing. AGU recognized Monasterskys work for his vivid description of the scientific importance of the mission, as well as showing the fiscal constraints and human interactions that shaped the missions success. Read Tennants A Cosmic Tale on The Virginian-Pilot Web site. Monasterskys A Plucky Spacecraft Explores a Distant Asteroid is on the Chronicle of Higher Education site. Eugenie Scott has done it again. 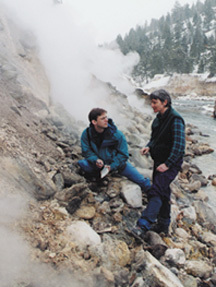 A recipient of the 2001 Geological Society of Americas Public Service Award, Scott was awarded the 2002 Public Service Award from the National Science Board (NSB) on May 7 for increasing public understanding of science and engineering. Scott, a physical anthropologist, has been the executive director for the National Center for Science Education, based at the University of California, Berkeley, since 1987. 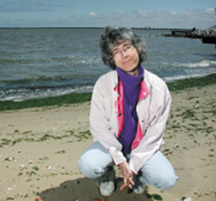 She has worked to raise the level of consciousness about teaching evolution in U.S. public schools. Scott shares the honor with the Society for Advancement of Chicanos and Native Americans in Science (SACNAS), an organization that promotes diversity in science careers for underrepresented Latinos and Native Americans. The United States Thunderbirds flew over Europe after World War II, demonstrating the aerobatic techniques of the U.S. Air Force. In 1947, Bill Crain worked hard as the crew chief for the Thunderbirds. He fixed the Air Force fighter jets: the F-80 shooting star, the F-84 and the F-86. He longed to fly for the Air Force; he had his pilots license, but at 17 years old the mechanic had a year to go before he could apply for flying school. Then the rules changed and, at age 18, Crain needed two years of college to pursue his dream. He was fresh out of high school traveling Europe with flying aces. Rather than leave the Thunderbirds, he finished his three-year commitment with the Air Force before turning to the University of Minnesota in Duluth. 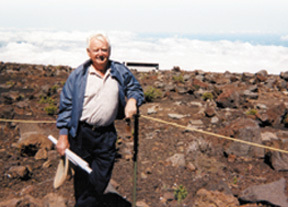 Bill Crain stands atop Haleakula in Hawaii. Crain retired from Chevron as a director and vice president in charge of worldwide exploration and production. In the spring of 1953, Crain was ready to graduate and move on to flying school. But he had one science credit he had to fill before he could receive his bachelors degree in business and economics. He chose a course in geology with professor Robert Heller. But in order to get into graduate school in geology, Crain needed a few more science credits. That summer, he got married and went back to college. I took all my geology courses from Bob Heller. After two years, Crain had two bachelors degrees and two kids to boot. He and his family moved to Minneapolis where Crain earned his masters degree in geology metallurgical engineering. Crain then began a lifelong career as a geologist with Chevron. In March, the American Geological Institute (AGI) awarded Crain and the late Bob Heller its William B. Heroy Jr. Award for distinguished service. Together Crain and Heller generated the vision and support for AGIs inquiry-based, secondary-school Earth science curricula. In 1992, Heller had contacted Crain with a proposal. He came to me dissatisfied with high school textbooks on geology, Crain says. He was interested in inquiry-based teaching, not handing the students stuff to memorize. Crain had the contacts at Chevron to help fund the project. AGIs Investigating Earth Systems is now adopted in 26 states. Middle-school teachers can use the nine-unit program as a full course presented in any order or as stand-alone modules in class. The initiative also jump-started AGIs high school curriculum, EarthComm, and a teachers guide for Investigating Earth Systems.